GK- David Marshall- Hull’s number one kept a clean sheet against Ipswich and will play between the sticks once again. RB- Reece Burke- With Eric Lichaj having been on international duty with America over the past week or so, Burke is likely to slot in at right-back again. CB- Jordy de Wijs- The Dutch defender had a great game against Ipswich for Hull and it was probably his best performance in the black and amber shirt. CB- Tommy Elphick- He looks to be a good signing by the Tigers and is expected to start again against Wigan. LB- Stephen Kingsley- The former Swansea City left-back has had a solid season so far for Hull and is enjoying his run in the team. RM- Jarrod Bowen- The 21-year-old got his first goal of the season against Ipswich and will be looking to add to his tally tomorrow. CM- Markus Henriksen- He has started every game for Hull in the Championship so far in this campaign. CM- Jackson Irvine- Daniel Batty went off injured against Ipswich so this paves the way for Irvine to start. The Australian international has scored three goals this season. 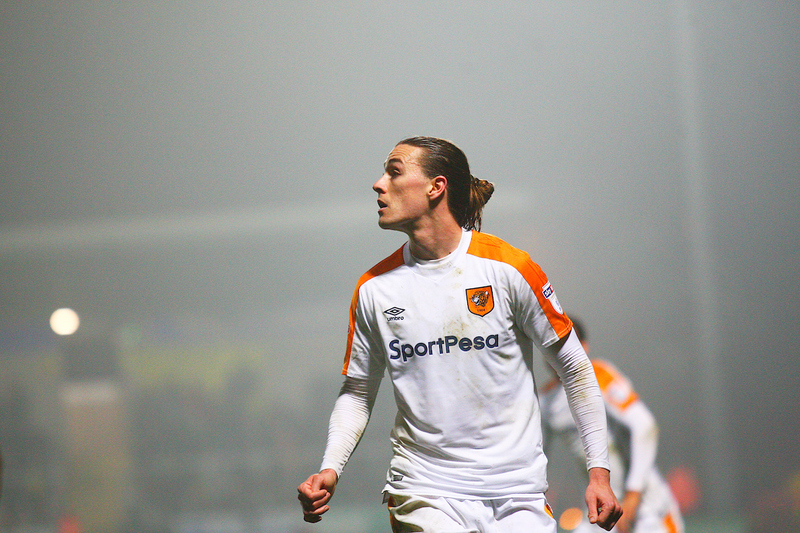 Hull City’s Jackson Irvine during the EFL Sky Bet Championship match between Burton Albion and Hull City at the Pirelli Stadium, Burton upon Trent, England on 10 April 2018. Picture by John Potts. LM- Todd Kane- The Chelsea loanee has turned out to be a shrewd signing by Hull. He works hard and has made the left midfield spot his own. CAM- Evandro- He is a class act and will start again. Anyone who has watched Hull this season will know that he is a very clever player. ST- Frazier Campbell- It is a close call between Campbell and Chris Martin. Campbell has started every game this season and his work rate is admirable.